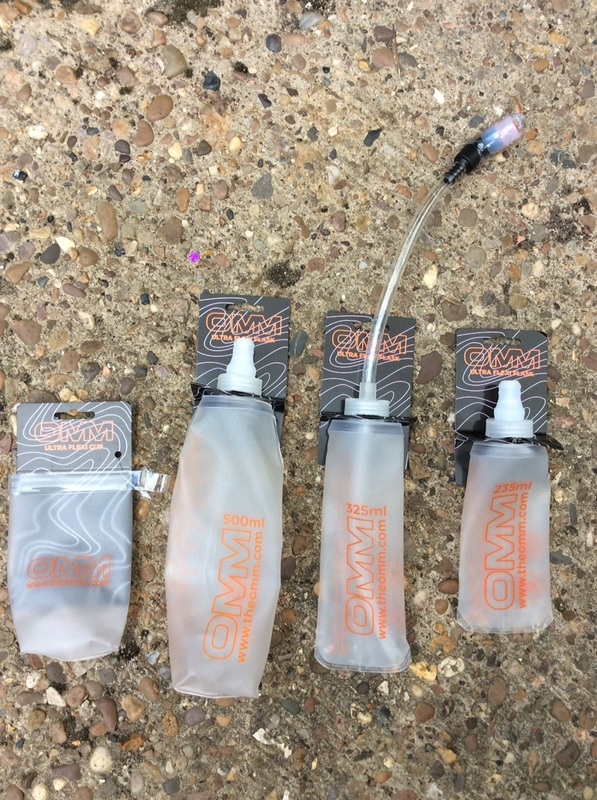 Check out your nearest OMM retailer this week as the new series of OMM Ultra Flexi Flasks have arrived and go to stores this week. There is a series of 3 models/sizes, the smallest & largest are supplied with bite valves & the middle size comes with a straw & angled bite valve head, this is interchangeable with the other sizes so you can swap the straw about, it is also custom cut to length, to suit your style & fit, simply by cutting the main straw length. The OMM Ultra Flexi flasks are flexible and compress as you drink to eliminate water bouncing/sloshing inside and reduce sucking effort. Easy to squeeze - with bite valve. Carry this Flexible water/gel flask in your hand, shorts pocket or race pack pouch or pocket. Carry gels, water, electrolytes and other fluids such as Ultra Fuel.. The compact / space-saving and lightweight solution to carrying your hydration/electrolyte/nutrition fluids. - Easy use soft Bite valve. - Flexible / squeezable, easily lets you squeeze out Gels, Liquids. - Compresses as you drink reducing pack volume and reducing sloshing. - Fill level indicators help you monitor fluid volume in both Ml & fl oz. - Slim & Lightweight easy to fill and clean. - PVC, Phthalate, Bisphenol-A free. - Straw & tube option can be added with purchase of 325ml version inc straw. - Easy use angled Bite valve. - Straw can be custom cut to exact required length. - Bite valve can be added from other size options. - Wide nick for quick filling & scooping. - Attachment point to clip & secure cup. 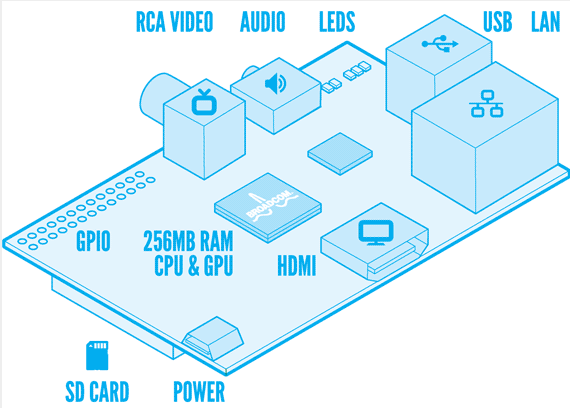 - Lightweight and Easy Clean. Extreme Food is specially formulated and nutritionally balanced with the Highest Energy Vs the Lowest pack weight & volume on the market. To ensure your body is fueled for maximum performance. Whatever your sport or activity Extreme Food powers you to achieve your goals. 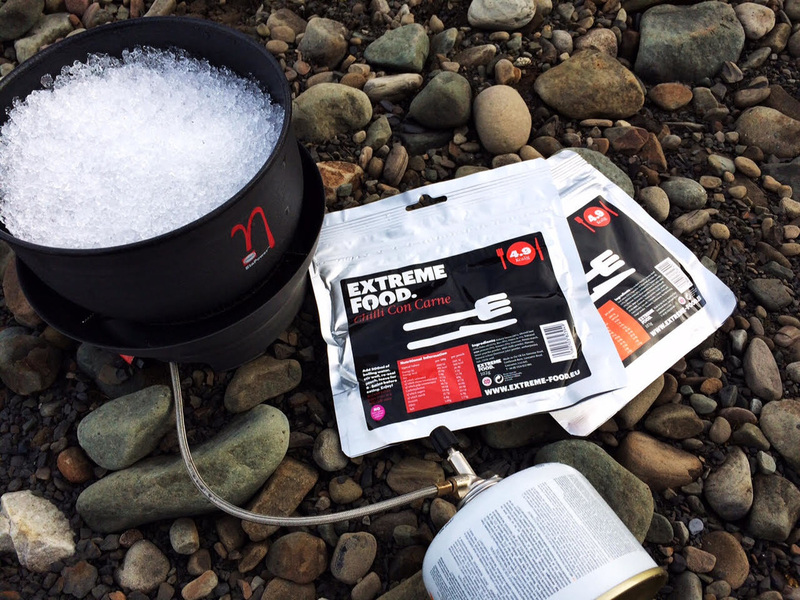 Extreme freeze dried Food. 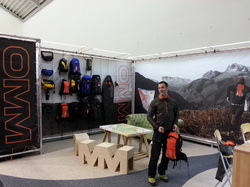 So here is a quick review of some of the OMM Highlights from ISPO by Julie Greengrass. Julie has a interesting past being the designer for many brands both you & I have used in the past and currently. So I have just returned from ISPO, the largest Winter Outdoor Fair in Europe, some also argue that it's larger than it's USA counterpart Outdoor Retailer. 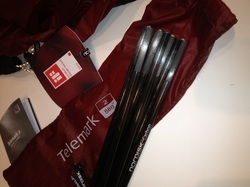 We had for the 1st Time OMM displaying at ISPO, but more of that in a future post, whilst we were there we hooked up with the guys from Nordisk & Yeti and got a quick peek of the new 1st off the production line Telemark Carbon. These are really shaping up to be in demand as the new lightest 2 skin tent on the block, as all the the lightweight community search for the next advancement in weight saving and functionality increase, it's easy to strip weight out but retaining function and features is hard. Nordisk seem to have balanced this well, by having one of the lightest Sil Nylon fabrics available on the market but still critically retaining strength and tear resistance. For those who want the absolute epitimy of lightest possible then they can purchase the Telemark series with Carbon Fibre poles, for those who want to be a bit more frugal but still very lightweight the range is also available with Ultralight DAC Alu poles. Other features that have been updated since the 1st dev samples were available are additional loops on main seams for extra guy lines if required, shaped zips to enhance entry, positioning and tensioning of the tent amongst many other tweaks, there appears to have been alot of user development and this only helps increase it's functionality. Design awards, well that fact that it has been nominated in many different areas is a testiment to the sucess and development of this series with the 2013 DGA (German Design Award) and the IF design awards as well as Outdoor Awards last Summer at Friedrichshafen. So stock should be available here in the UK from the end of next month, if you have any questions give me a shout ! I have just invested in a set of Winter tyres for my car, some people think that it is a expensive exercise to put winter tyres on their vehicle however due to decreased wear on your summer tyres, and the rotation between your 2 sets, over the ownership of your vehicle the tyre purchasing averages out, making winter tyres a option for the colder conditions if you plan it all well. I am also interested in the performance of the tyres over a typical UK Winter it's not law here in the UK to fit winter tyres, unlike many of our European counterparts, with the mixed warmer and colder winters. We can experience any conditions from sub zero freezing, snow, heavy snow, frosts, ice, hail, rain, lots of it and warm days mixed in so we can reliabley say UK winters are all seasons mixed into a few short months. I potentially travel all over the UK through work over the winter so there is lots of potential to hit lots of mixed conditions in all regions of the UK. I have opted for a set of Bridgestone Blizzak winter tyres to fit to my Mini Countryman Cooper SD ALL4, this is a hybrid SUV small to medium car but with the advantage of 4 wheel drive. Which tyres to select ? Well I went with the Bridgestone Blizzak LM-25 winter tyres, non runflat, in a 195/60 R16 89 H M+S marked tyres, mainly because these matched the vehicle manufactures tyre advice plate fitted in the doorframe of the vehicle. The advantage of a winter tyre is that they will provide better grip than their summer counterparts in temperatures below 8deg C. This is due to the compound of the rubber being developed specially for cooler temps, also they have better handling on snowy and icy roads as well as wet conditions, the blizzak tyre has a special design to help in these conditions with the specially computer designed tread pattern with high silica content lens shape blocks with honeycomb sipes on the shoulder blocks for premium performance. Well we have had the 1st few cold days as this is typed and the tyres have just been fitted, so lets see how the winter goes and I will review then once they have ungone some miles on the road. Well after a serious lack of climbing facilities in the East Midlands suddenly they arrive like Buses, all at once or nothing at all. After a lengthy abcence from Climbing now that two top class bouldering facilities have arrived, I felt it was time to dust off the shoes and see if it is possible to re-kindle the power and climbing strength that I had back in my youth over 18 years ago. So 2 weeks back and I hurt everywhere lots but I feel I may be able to limber my way back to some sort of decent form ? The two walls are The Climbing Depot (Nottingham) & The Climbing Station (Loughborough) both have their plus and minus points but both unique in their own way, offering quite varied climbing styles and options for two bouldering walls. I took a quick bit of Mobile film of the Depot Nottingham built in a old Tram station, it is a spectacular building and shows some interesting history. I have been receiving a lot of interest in the new OMM Mountain Raid Sleeping Bag, so I thought I would give you a bit of a quick insight prior to it's arrival on UK shelves. The aim with the Mountain Raid was to design the bag which we would want to use when running on the OMM or other events/activities where weight vs performance was critical. We wanted it to be warm enough for use, light, have good performance in the lovely UK weather and compact. The bag designed weighs 400g and stuff's down to the size of a Grapefruit, combining loose laid Pertex Quantum over 60g Primaloft One synthetic insulation on top and 40g Primaloft One synthetic insulation on the bottom, full footbox with external hangtags to dry/air and cowled hood. Also it features a offset 1/4 zip with again a P1 isulated baffle to protect aginst a cold zipWe found that this combination offered an active Mountain Marathon racer the right perfomance for the OMM, gave a windproof bag for emergencies and a system that would provide a insulative value when both wet or dry (packing accidents do happen). It will be in the shops in October '12. So I met Bob from Backpacking Light at the Outdoor Show in Friedrichshafen, for those who don't know this is the largest Outdoor Trade show in Europe for the Summer Season, this is like the best Outdoor Shop you can imagine then multiply by 1,000,000 it is non stop kit from A - Z. Bob run's his own speciality business selling lightweight outdoor kit www.backpackinglight.co.uk but his passion is also journalism he loves looking at and reviewing and even interviewing brands and individuals who are bringing new things to the market. Bob does this through the medium that he has pioneered to the Gear loving outdoors public the Podcasts of the Outdoors Station. 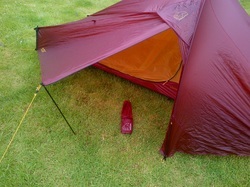 This brings me to where we both met at Outdoor, I am the UK distributor for Nordisk www.nordisk.eu and at the Show we launched what is currently going to be the lightest 2 man tent on the market, and it is a 2 skin tent (inner and Outer) not single skin. Have a listen to the podcast and hear what it is all about. http://www.theoutdoorsstation.co.uk/2012/07/no-347-friedrichshafen-outdoor-show-2012-part-1/ or click the image below. The pre-order is in !! 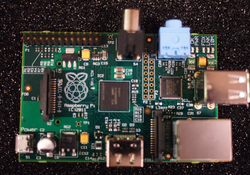 The 1st 10,000 are sold, next batch is on pre-order expect to see alot of development and innovation coming from the open source community and tech savvy youth of the world ! The Worlds cheapest computer once it reaches the masses. Re-name OMM-i-Gamy and win one. wasn't. So we want a new name for it. use of cords and folds would make into the best bottle holder in the world. the short list will get one of "whatever it is going to be called in the future"
Any questions give me a shout !